Melissa Roxas was born on October 23, 1977 in Manila, Philippines. In 1986, the same year after the fall of the Marcos dictatorship, when Melissa was nine years old, she migrated along with two siblings to Los Angeles to be reunited with her mother, where Melissa would grow up and become a woman. After graduating from high school in 1996, Melissa’s interest in community work, particularly in health care, manifested when she was a student at the University of California, San Diego (UCSD). She had the intention of one day going to medical school. While in UCSD, Melissa was an active member of Kaibigang Pilipino (KP), the campus-based Filipino student organization and the Asian and Pacific-Islander Student Alliance (APSA). 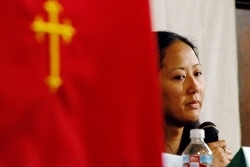 In 1998, Melissa served as the playwright, lyricist, and director of “Kalayaan” (Freedom), a musical play about Filipino culture staged at UCSD. In 1998, Melissa co-founded and later served as director for Active Students for Teens (AST) in which she tutored and mentored third-grade children. In the same year she volunteered with Educational Enrichment Programs working with preschool children from disadvantaged communities, to promote reading and learning skills...In 2007, Melissa traveled back to the Philippines to conduct research for a writing project and to dedicate more of her time to community health work. On May 19th, 2009, while on a medical mission in Tarlac, Melissa Roxas became a victim of a human rights violation herself when she was abducted at gunpoint and held against her will for six days, while being subject to physical and psychological torture until her surfacing in Quezon City on May 25, 2009 (Justice for Melissa). 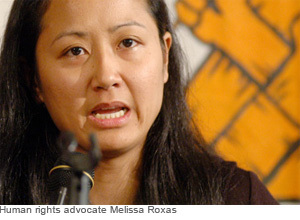 Help Surface Filipina-American Activist Melissa Roxas, Abducted By Suspected Elements of The Philippines Military! IMPUNITY. Prosecutions of Human Rights Violations in the Philippines.